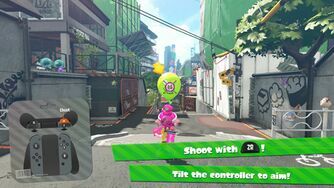 The in-game tutorial in both Splatoon and Splatoon 2 introduces players to the basic controls and techniques used in the various game modes. 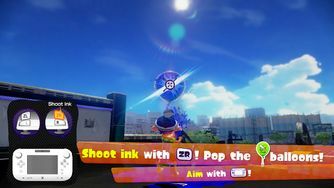 Upon starting the game for the first time, the tutorial begins after the player has customized their Inkling's appearance. The introduction to the tutorial. Upon beginning the tutorial, players will encounter two sets of instructions. The first includes an image of four Inklings and states, "Hey, you. Yeah, you! Wanna be the freshest squid on the block?" This window can be bypassed by pressing . The second set of instructions displays an image of various Inklings performing tasks such as swimming through grates and Super Jumping and reads, "We'll teach you some funky-fresh moves on the way to Inkopolis!" Like the first message, this window can be bypassed by pressing . Splattack! (Jam Session) by Squid Squad, a less intense version of Splattack! In fact, this is the only area in the entire game that plays this song in particular. An even less intense looped version can be heard in the Shooting Range. A downed UFO can be found in the area with Octarian ink surrounding it. This is the same UFO the Squid Sisters mention in the beginning of the game. A slightly altered version of the map can be found in the Octo Valley Mission Unidentified Flying Object. Map of the tutorial stage. The in-game tutorial helps new players learn the basic controls and techniques of Splatoon 2 for other modes. 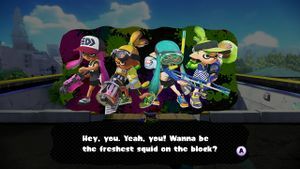 Upon starting up the game for the first time, players are able to access the tutorial after customizing their Inkling's gender, skin tone, and eye color, hairstyle, and choice of legwear. The tutorial takes place in the back alleys of Inkopolis around an construction site. “ Think you're too cool for school? Well, it's time to prove it in battle! You're looking a little green, though... Let's start with the basics! It is possible to skip a section of the tutorial by climbing on top of some crates that are present at the beginning, enabling the player to jump over the wall leading to a later section. This stage later returns for Octo Expansion mission Labyrinth Station, but in reverse. Pearl and Marina also comment on this.